As you know, the only proper environment to evaluate gear is in a reference system where there’s an appropriate amount of space and setup time. 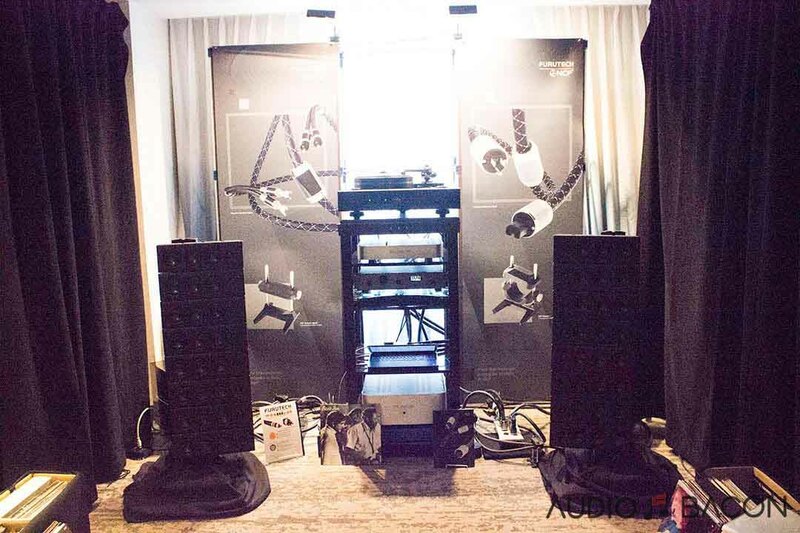 Given the fact that a single ethernet cable could dramatically alter the tone and presentation of a system, it’ll be difficult for these guys to get lucky on sound. In view of this, it really speaks volumes about the exhibitors and their products when a room at a show sounds exceptional. 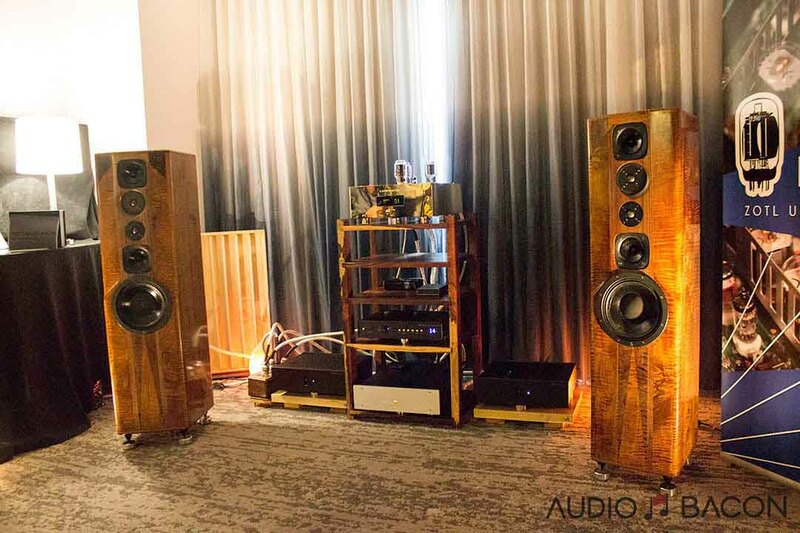 With over 160 listening rooms, it was extraordinarily tough to narrow them down to the Top 10. After much discussion, these were our top listening experiences at the show (in no particular order). The best bang for buck speakers I heard at AXPONA. 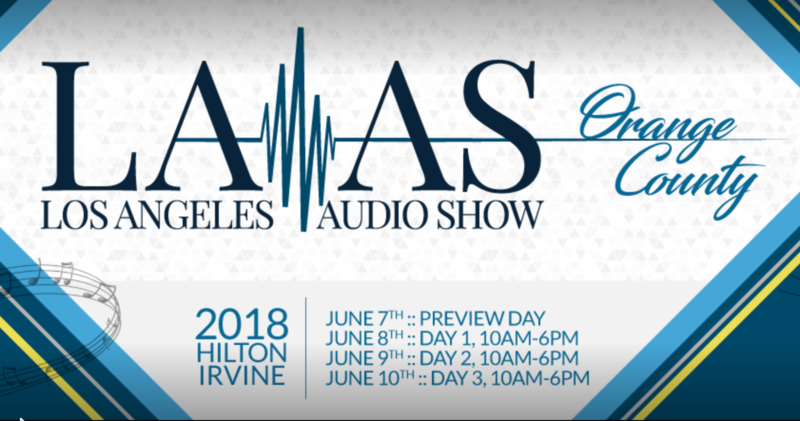 This configuration with the Falcon LS3/5a 15-ohm BBC Licensed speakers ($2,995/pr and $3,250 in deluxe finishes) driven by the Line Magnetic LM508 Integrated amplifier (SET 805) ($4,995) was one of my top picks from the show…regardless of the price. Voices sound so natural and properly textured while still being able to lay out the musical complexities effortlessly. 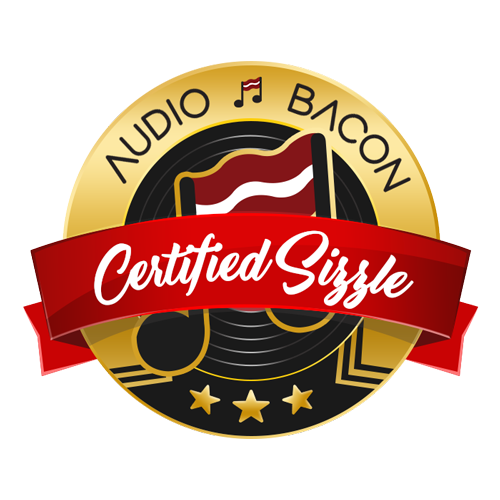 There’s a nice euphoric coat over the sound that gives it an alluring appeal without masking the music. It’s a system that sings to the soul rather than the fleeting mind. 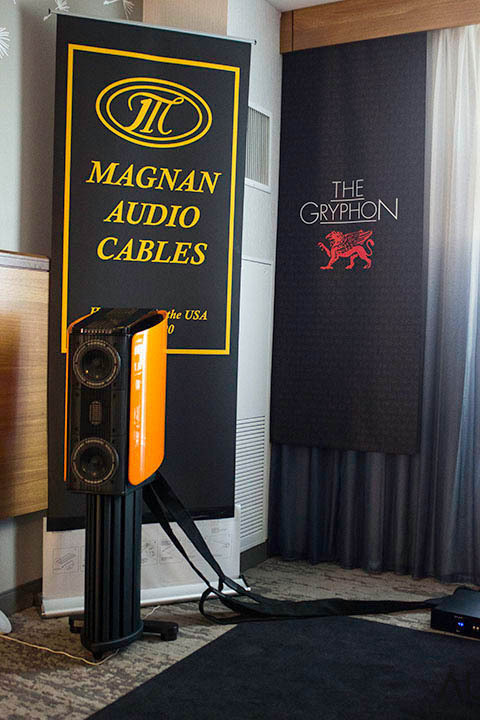 Gryphon Diablo 120 with DAC module, Sonett phono stage (North American debut), Scorpio S CD player, Pear Audio turntable, Magnum Cables, Gryphon Mojo S loudspeakers ($24,753). 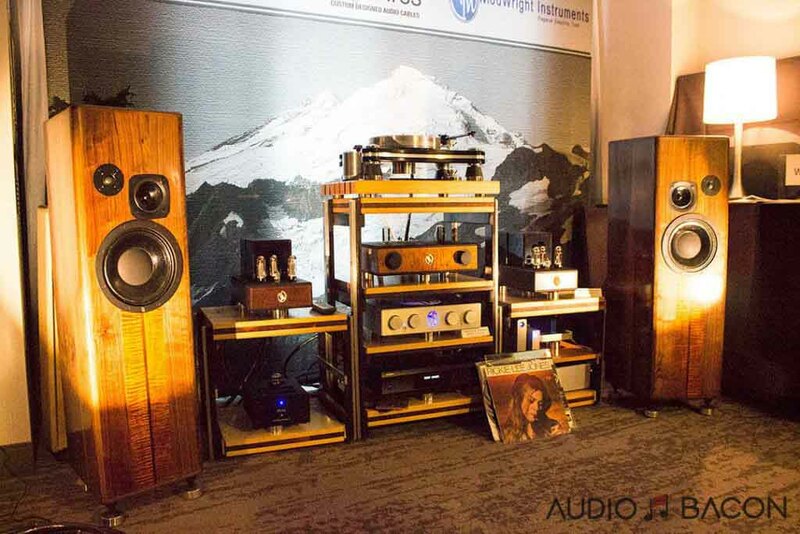 One of my favorite loudspeakers at the show. Musicality with layers upon layers of rich and tactile textures. Male and female vocals overlay in such a natural and physical way. Frequency extension is cohesively strong and assertive. An unforgettable system from the show. Cube Audio F8 Magus speaker ($9,900) and First Watt F7 amplifier ($3,000). Clean, pinpoint imaging, fantastic layering, and FAST. 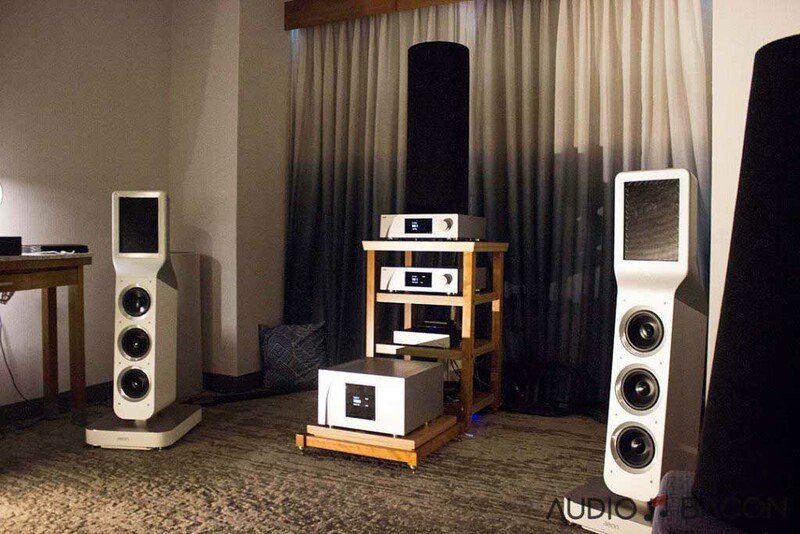 I expected these speakers to be more uplifted in the treble region but there was a beautiful layer of dense color. Admittedly, a very difficult balance to achieve in an audio system. I’m sure this is due to the much warmer sound of the F7. If there was an example of system synergy, this would be it. 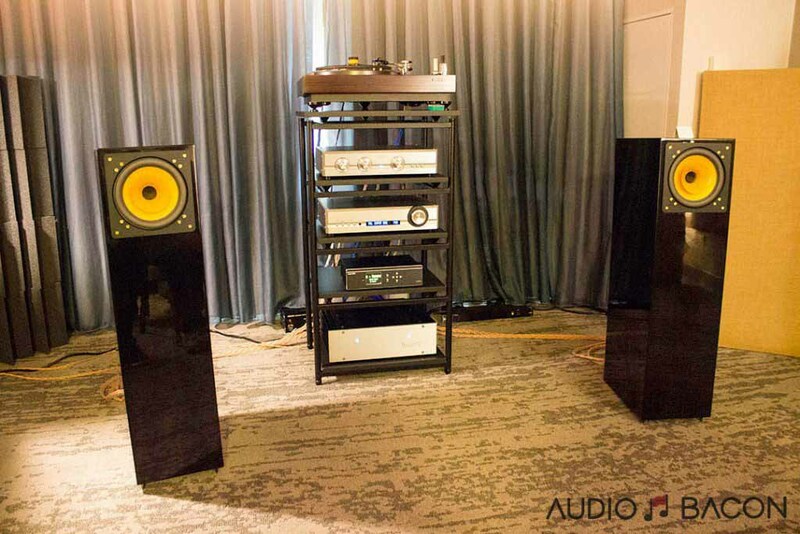 In the Top 1% as far as sound quality at the show and one of few rooms I revisited. These guys obviously put in the work to make sure the speakers sounded great in this room. One of the most aesthetically coherent combination of gear as well. No room treatments required. I’ve heard them at other shows but the The Amazing Line Source ($18,500) has never sounded this good. Accuracy in height and body with an infinite soundscape layered in all directions. This time, it’s accompanied by a more palpable tone. 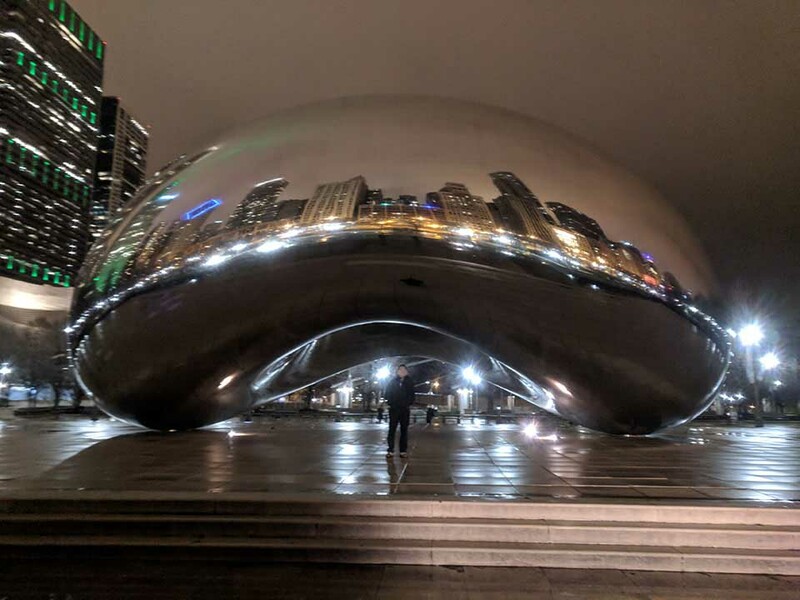 It’s almost like a holographic image placed before you. Quite the experience. CD Player: Kalista DreamPlay One $48,000 (*new product, just announced at AXPONA, combine DreamPlay CD transport and DAC into one unit). Turntable: Thales TTT-Compact II Turntable $14,850. Tonearm: Thales Statement Tonearm $21,090. Cartridge: EMT JSD VM $4,995. Phono: Karan Acoustics KA Ph Reference Phono $23,995. Preamp: Karan Acoustics KA L Reference Preamp $16,995. Power amp: Karan Acoustics KA M 2000 Monoblocks $59,995 (a pair). 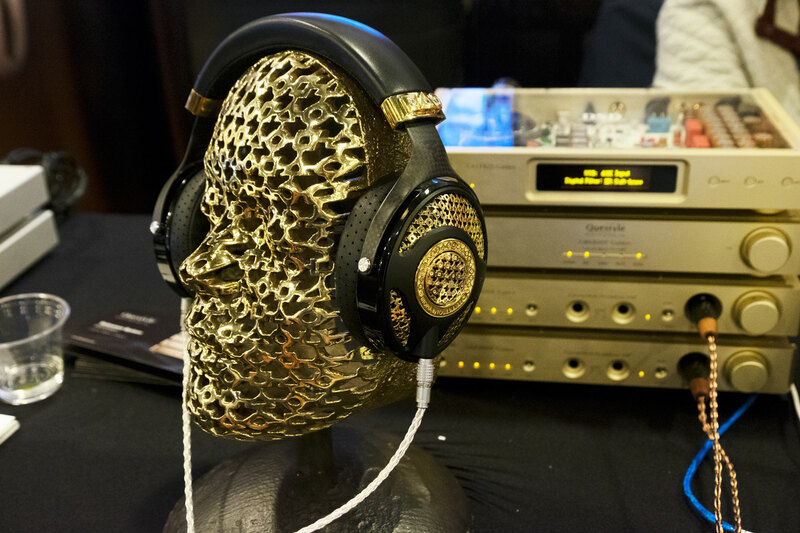 Speakers: Penaudio Sinfonia $27,000 Cables: ZenSati Zorro and Seraphim. Spent some quality time in this room. Unequivocally one the best sounds from the show. Very dynamic, resolute, euphoric, and tonally accurate. Piano, in particular, sounds very convincing on this system. Startling fidelity and very addictive in its nimble articulation. Reaches far into the room with proper tone and timbre. Rethm Bhaava speakers ($4,499/pr). 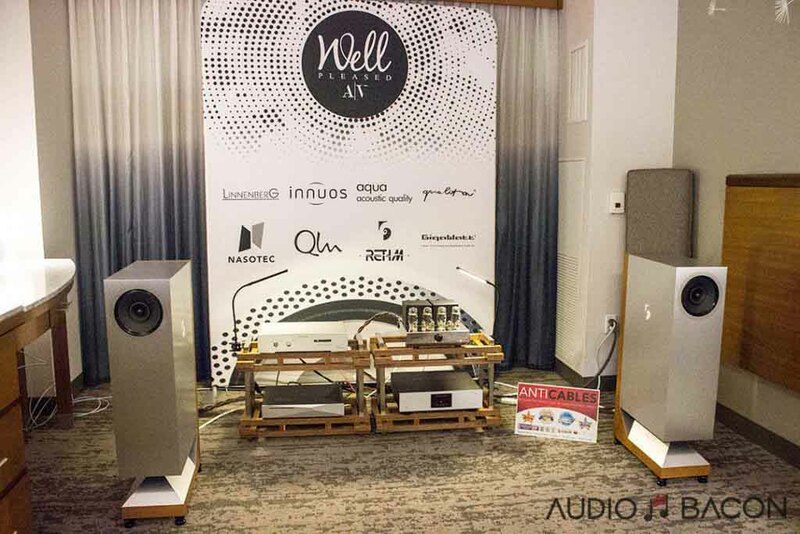 This room is featuring the new Aqua Hifi La Voce S3 Discrete DAC ($4,700), Innuous Zenith SE server ($7,000), Gigawatt PC-3 EVO SE power conditioner ($6,300), and Audio Hungary QUALITON A50i, Class-A integrated amplifier (2 x 50W, ~$8,000). This combination of gear sounded incredibly smooth, resolving, with the right amount of tonal weight and timbre. Instrumentation and voices are precisely localized in the soundscape while effortless relaying quick and heavy dynamics. One of the new products at the show, the Epoque Aeon Fine ($140,000/pr). Incorporates the unique bending wave technology: This bending wave technology is based on the principals of sound creation through musical instruments. It had an unconventional sound for a speaker (in a good way) and provided a very resolving and tactile sound that was very “accurate” sounding. 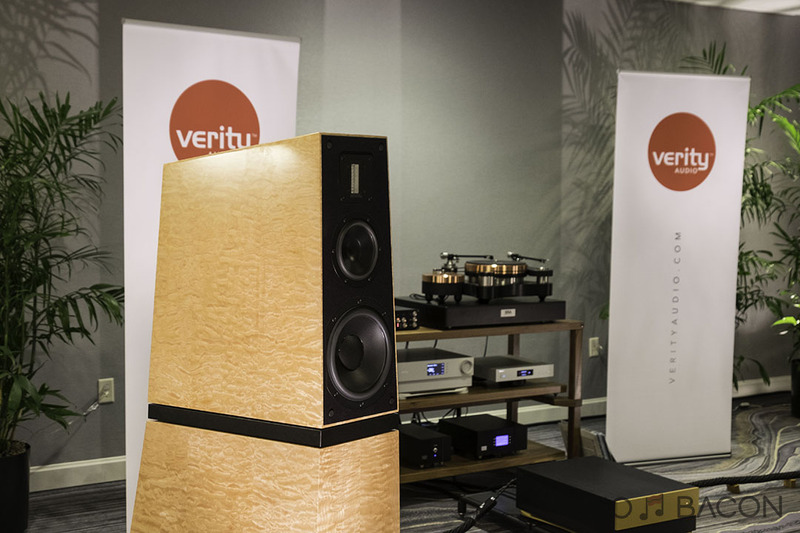 One of the very few speakers I heard at the show with a nice show of tactility and textural nuances. It’s a “new sound” I haven’t heard from a system before. Lampizator Pacific DAC ($29,995) with its 300B/5U4G/6H6P tubes is beautifully shiny and sounds phenomenal. This config also includes: Lampizator SuperKomputer ($8,500), LTA MicroZOTL preamp ($3,850), Ultralinear ZOTL power amp ($6,800), and Skogrand cables Vivaldi Series ($750/2m). 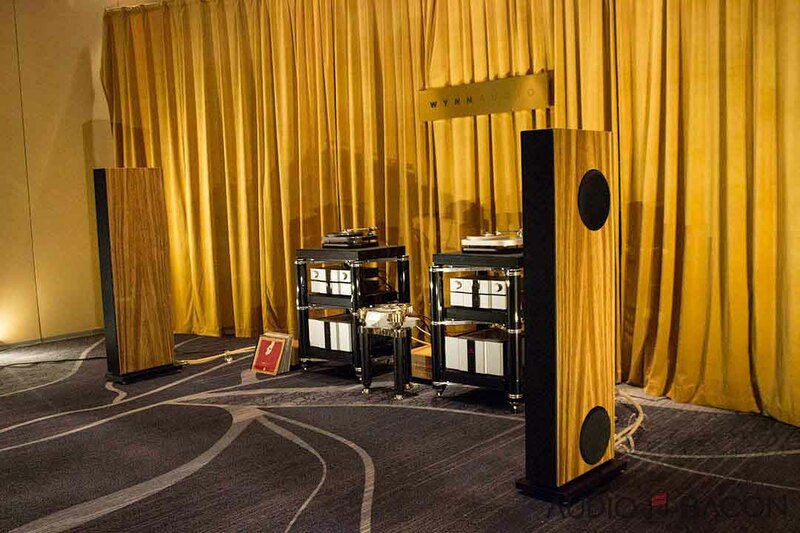 Daedalus Apollo 11 speakers ($22,800) with Daedalus DiD-SPK and DiD isolation devices. Daedalus is killing it with its second entry on this list. The combination of these fantastic products simply forms a tonal gestalt of euphoria and bliss. A perfect balance of clarity, detail, warmth, and texture. Just a very organic and inviting sound that keeps you in your seat. One of the few standouts at the show. 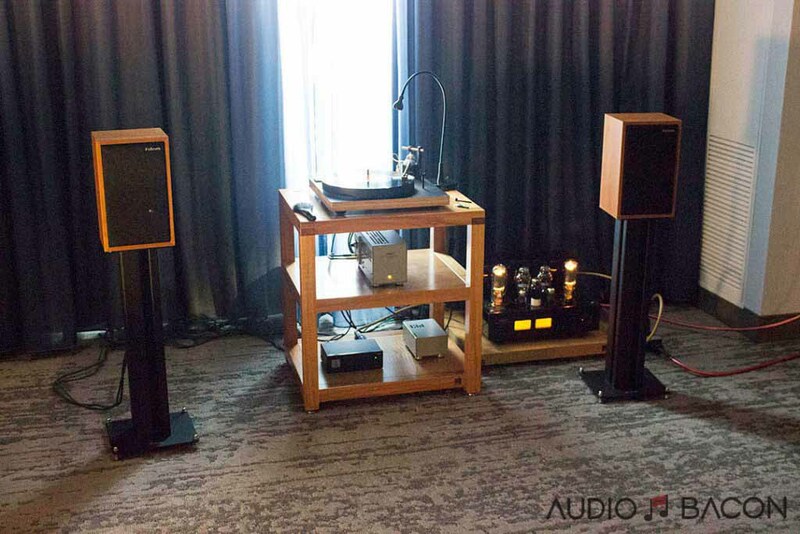 Analog: Kuzma Stabi M turntable ($19,225), 4Point9 tone arm with CC wire and ETI Silver Bullets RCA plugs ($3,995), CAR-50 Low-Ouput MC cartridge (0.3mv) ($5,895), and Plinius Krou SS phono stage ($3,450). Digital: Dell PC with 500GB HD, HRT Music Streamer HD USB DAC ($500). 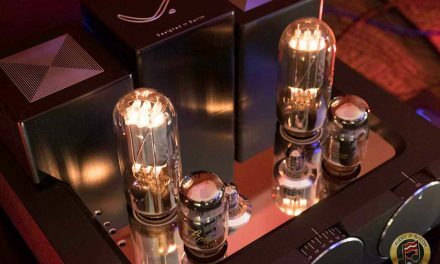 Preamp: Manley Labs Jumbo Shrimp all-vacuum tube line stage ($3,995). Power amps: Plinius Audio SA-201 stereo 200 wpc SS Class AB ($6,545), HRT Stage Control Center 80wpc stereo SS Class AB Integrated with 24/96 USB DAC ($800, display). 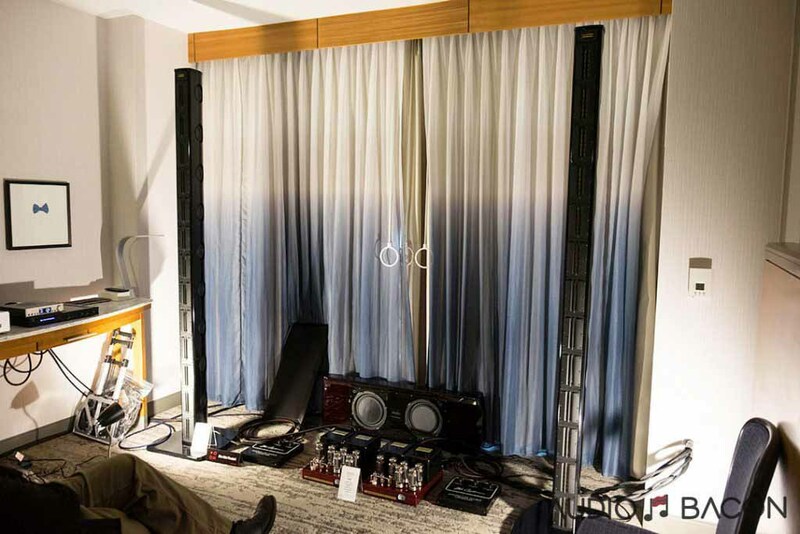 Loudspeakers: HRT Stage VIII speaker system ($650/pair, 4 pairs in this setup). Sound Anchors Pro Series speaker stands with adapters for speakers ($900/pair). Subwoofer: 2 x REL S/3 powered subwoofers ($1,999/each). Speaker cables: Custom Furutech PCOCC Single-crystal stereo set ($900), Power cords: Furutech FP-S55N, 10-gauge nano AuAg bulk power cable ($193/m), Furutech Fi-50/50M NCF power and IEC plugs ($385 each). Furutech DPS-4, 11-gauge DUCC ultra-crystalline bulk power cable ($450/m), Furutech FI-50/50M NCF power and IEC plugs ($385 each). Interconnects: Furutech DPS-4 ($450/m) with Furutech CF-102 RCA plugs ($171/pair, two pairs in this setup). USB cable: Furutech GT2Pro @ 1.8M ($316). Power distribution: Furutech e-TP609 NCF + GC 303 Ultra-Premium power distributor (3 x GTX DR NCF outlets ($2,200), Furutech Flux-50 Filter NCF ($1,250), Shunyata Venom Defender ($199), Relaxa 530 Magnetic Suspension Component Platform (used under the Manley Preamp) ($1,250). A bit tucked away, one of the hidden gems of the show. A very unassuming setup with speakers I didn’t recognize. This system had the best sounding vocals at the show. Period. Humanistic textures with warm-blooded weight and exertion. This is done without sacrificing outlines and resolution. Macy Gray’s The Way never sounded so physical, full, and believable. Thank you, Scot Markwell for creating such an amazing listening experience.